KNOXVILLE, Tenn. – The University of Tennessee Board of Trustees formally announced today the new Herbert College of Agriculture, named for distinguished alumni Jim and Judi Herbert. The name replaces the College of Agricultural Sciences and Natural Resources and was officially approved by the Board at a specially called meeting on April 17. The Herbert College of Agriculture becomes the third named college in the University of Tennessee's 224-year history and only the second land-grant agricultural college in the nation named from a philanthropic gift. The Herberts, both alumni of UT Knoxville, are strong supporters of the university and the Institute of Agriculture. "We are especially pleased about enhancing the student experience through internships in national agribusinesses and international work," said Jim Herbert, co-founder and executive chairman of Neogen Corporation, an international food safety company headquartered in Lansing, Michigan. "We hope this gives students studying agriculture every opportunity to become great contributors to their world." Judi Herbert added, "Jim loves to say that to whom much is given, much is expected, and it's a mantra by which we live. The University of Tennessee is where many of our family members have called home, so it was only natural to reinvest in this special place." 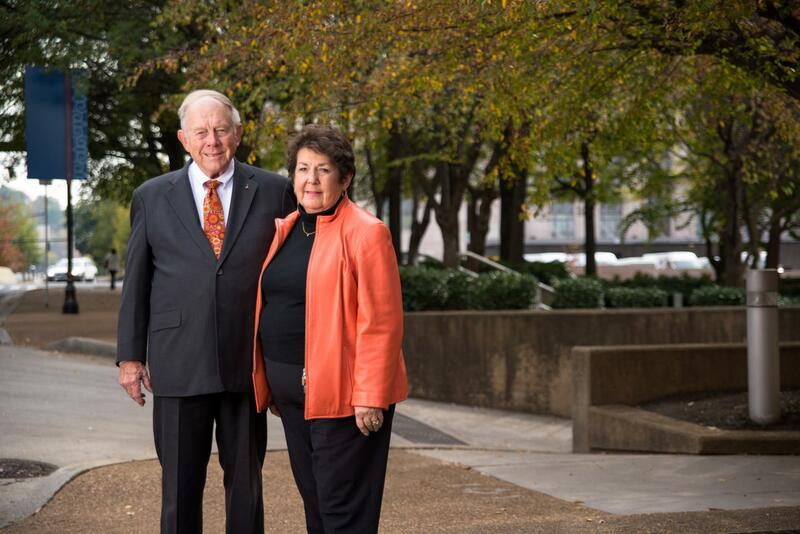 The Herberts have a longstanding personal history with UT. Jim grew up on a farm outside Memphis and began his UT career earning room and board watering the plants in an Institute of Agriculture greenhouse. He graduated with an animal husbandry degree in 1962 and received the college's first-ever honorary Ph.D. in 2016. Judi graduated with an English degree in 1963 and has a passion for enhancing student writing skills, providing support for the Writing Center for Knoxville-area UT students. "This tremendous gift is most amazing because of its flexibility," said Tim Cross, chancellor of the Institute of Agriculture. "The Herberts' desire to enhance student learning, faculty engagement and programs make this endowment truly capable of empowering the Herbert College of Agriculture for generations." The college joins the Haslam College of Business and Tickle College of Engineering as the only named UT Knoxville colleges, with benefits that extend well beyond the new name. "This gift will be among the most transformative in the university's history," said UT President Joe DiPietro. "It will elevate the college into an elite group of the very best public, land-grant colleges of agriculture in the nation." Initial plans for the gift include enhanced experiential learning programs for students and faculty, along with professional leadership opportunities in agriculturally related businesses and organizations. "This investment will help recruit and retain the best faculty, attracting and supporting both graduate and undergraduate students and providing best-in-class educational experiences through our programs," said Caula Beyl, dean of the new Herbert College of Agriculture. "This will allow us to build on our historic past while strategically preparing for the future roles of our college." The college has enjoyed record-setting growth over the past five years, with more than 1,700 undergraduate, master's and doctoral students now enrolled. One-fifth of these students are taking part in study abroad opportunities. The college has awarded more than $1 million in scholarships annually in recognition of academic achievement. Just this year, two more students were named as Fulbright scholars, bringing the total to four. "Philanthropic investments like this are catalysts for advancing the land-grant mission and making a global impact," said Keith Barber, vice chancellor for Institutional Advancement. "Jim and Judi have hearts for educating students who have the potential to change the world for the better." The eight departments that make up the college are agricultural and resource economics; agricultural leadership, education and communications; animal science; biosystems engineering and soil science; entomology and plant pathology; food science; forestry, wildlife and fisheries; and plant sciences. In 2018 the University of Tennessee Institute of Agriculture is celebrating an important milestone – 50 years of excellence in providing Real. Life. Solutions. through teaching, discovery and service. The Herbert's seminal gift sets the stage for success for the state's agricultural and natural resources students for the next 50 years and beyond. Visit ag.tennessee.edu to learn more.